1. The news out of Cincinnati and LA reminds me, yet again, how miraculously sensible the Ashland BRT proposal is. At a time when it is in vogue – even in LA, which, despite its reputation, is probably building more and better public transit than any other place in the country right now – to spend gobs of money on vanity transit projects aimed at attracting development instead of actually giving people better transportation options, Chicago’s major transit infrastructure programs are about bringing already-existing lines up to good repair and expanding their capacity, and creating cost-effective large-scale rapid transit along one of the most important corridors in the city. LA’s downtown streetcar – which would crawl through mixed traffic in a four-mile loop, barely two miles on its longest side, and therefore be practically useless for actual commuting or traveling – is going to cost at least $125 million, or ~ $30 million a mile. Cincinnati’s half-dead streetcar project – also a four-mile loop, also basically pointless as far as transportation goes – is $133 million. Ashland BRT is 16 miles of El-quality transit for only slightly higher cost. I don’t know what else to say about this, except: yay. And: man, does this need to actually happen. [But f]reezing the housing supply while raising wages will attract higher-skilled workers and push out lower-skilled workers, turning the city’s real estate market into a giant sorting machine. There is a tendency on the left and the left-leaning center – one that I certainly share – to believe that all of our major problems are about the distribution of resources. Crime will go away when people have legal economic opportunities that are more attractive than selling drugs or stealing. Schools will be better when they’re fully paid for, and the children in them don’t have to worry about money-induced stress at home. Housing affordability won’t be a problem when everyone is paid a living wage. On crime and schools, I’m pretty much on board. But housing really is different: if there are a limited number of homes within commuting distance of a major source of jobs and amenities, then those homes will go to whoever the richest people are. It’s a zero-sum game, in which a rising tide doesn’t lift your boat unless someone else’s boat sinks. And if the richest people get to congregate in one corner of the city, then they will have the best amenities, job opportunities, schools, and so on – so while a higher wage might make your neighborhood more livable, it won’t get rid of the fundamental problem of inequality: not just of outcome, but of opportunity. The only way out of that trap is building more housing. No one wants to hear that (except, I guess, developers and the tiny brigade of Gated City-ites), but it’s true. What you’re looking at is housing prices in the four largest Texas cities. All four are going through major housing booms; Dallas, Houston, and San Antonio allow new development and housing units relatively easily; Austin does not. Starting on the left side of the chart, you can see that new development in Austin is more expensive than the other three cities – about $50 more than Dallas and $150 more than San Antonio. But as we move to the right – to older buildings – the gap gets much bigger. 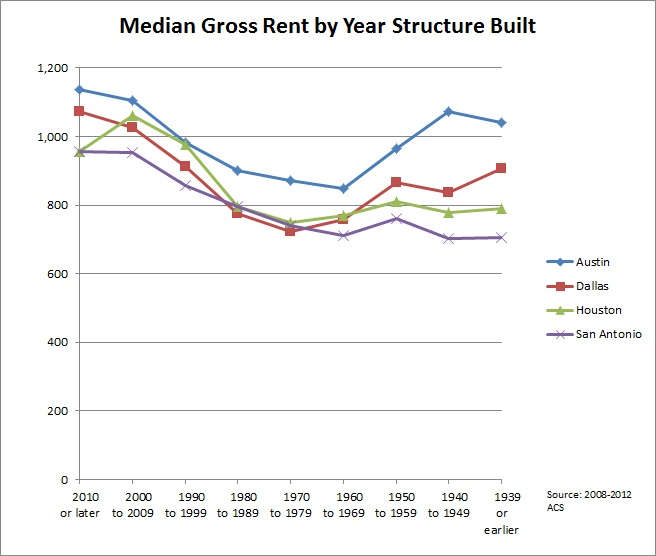 By the time we’re looking at housing that’s at least 70 years old, median Austin rents are at least $100 more expensive than Dallas and $300 over San Antonio. What’s happening is that with new development, there’s a floor to how cheap rents can be – it’s expensive to build apartments, and no one will build them unless they can get rents that will cover costs. With older buildings, though, all that matters is the cost of maintenance, so they should be relatively cheaper. But if developers are blocked from attracting high-rent tenants to new development, they’ll attract them to older buildings by renovating them to luxury-market standards. This is called “filtering up,” and it’s why preventing new luxury development doesn’t stop gentrification – it exacerbates it.